Gordie Howe missed an empty net with 28 seconds to play so his Detroit Red Wings had to settle for a 2-2 tie with the Toronto Maple Leafs last night. 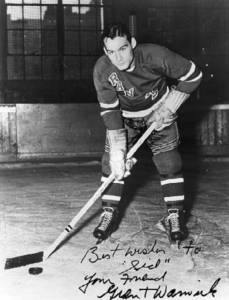 In the only other National Hockey League game Harry Howell, one of the best defensive defencemen of this generation, was the scoring hero for the New York Rangers as they routed the Boston Bruins 7-1 at Boston Garden. Murray Hall’s goal with just over six minutes remaining in the game lifted the Red Wings into their 2-2 tie with Toronto. But the most shocking aspect of this game was the miss of an open net with just 28 seconds left to play by the great Gordie Howe. After a scoreless first, the Red Wings finally broke the 0-0 tie thanks to a goal by Floyd Smith at 13:32 of the middle frame. Going to the third, the Wings maintained that 1-0 lead. Leafs roared out of the gate in the final period, with Ron Ellis evening the score at the 1:00 mark. Seventy-four seconds later, Eddie Shack put Toronto up 2-1 and it looked like the Leafs would eke out a win. The Red Wings refused to give up and their efforts resulted in Hall’s equalizer. 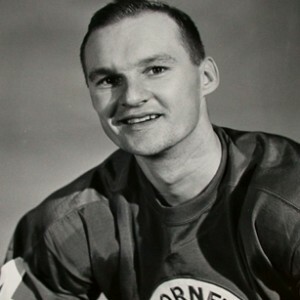 Bob McCord, called up from Pittsburgh the day before, took a long shot that was tipped on goal by right winger Bruce MacGregor. Toronto goalie Bruce Gamble managed to make the difficult stop, but Hall was in the right place at the right time to lift the puck over him and into the Toronto net. That goal didn’t end the excitement of a finely-played match. The teams traded scoring opportunities right to the final buzzer. Dean Prentice had Detroit’s best late chance, blasting one just wide before Larry Jeffrey of Toronto banged one off the post seconds later. How do I explain to Mark (Howe’s son) how I missed that open net with just 28 seconds to play? I have no excuse. The puck was laying flat. The goal was empty. I too such careful aim and then missed by a foot. And that’s the second open net I’ve missed in two games with those characters. Bobby Baun was the best of the Leafs. The hard-hitting blueliner laid a check on every Red Wing that dared venture into the Toronto zone on his side of the ice and even caught a couple on the other wing as well. Howell, who had only six goals total in the previous two seasons, fired a pair for the Rangers last night against the Bruins. Other Ranger goal getters were Vic Hadfield, Don Marshall, Orland Kurtenbach, Earl Ingarfield and Rod Seiling. 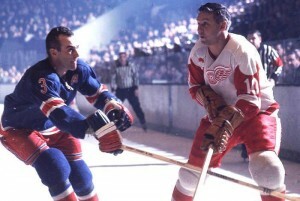 Ron Schock was the only Bruin to beat New York goalie Ed Giacomin. Howell, a 33-year-old native of Hamilton, Ontario, scored both of his goals on long shots from the point. The goals came in the first and third periods, beating Boston’s promising young netminder Bernie Parent. Giacomin was given large credit for the win by his team mates. The Bruins came out flying in this one, mounting a 21-shot barrage in the opening frame but were able to come away with only Schock’s goal. This was an inept a performance as the Bruins are likely to have all season. Their play lacked any cohesion and there was no fire or drive. Rookie coach Harry Sinden may have a bit to learn about motivating the modern athlete if this performance is any measure of the Boston will to win. The San Diego Gulls won their second game of the Western Hockey League season last night with a 9-1 drubbing of the Los Angeles Blades right in Los Angeles. It was the third game in as many nights for the Blades, and it showed. Warren Hynes and Gordon Wilkie led the Gulls with two goals each. Singles came off the sticks of Johnny MacMillan, Fred Hilts, Al Nicholson, Ed Ehrenverth and Len Haley. Jerry Toppazzini was the only Los Angeles player to beat San Diego goalie Les Binkley. The second-place Hamilton Red Wings continued their fine play with a solid 5-2 home-ice win over the Toronto Marlboros in one of two Ontario Hockey Association games played last night. Kitchener outscored Peterborough 6-4 in the other contest . The win leaves Hamilton just one point behind league-leading St. Catharines. 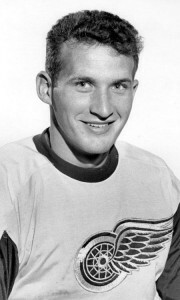 Ron Climie, a graduate of the Hamilton Police minor hockey system, scored twice for the Red Wings. Sandy Snow, Don Giesebrecht and Jim Adair added singles. Al Osborne and Gerry Meehan replied for Toronto, who outshot Hamilton 40-32. Hamilton goalie Gerry Gray was a star between the pipes for the hosts. Montreal Canadiens say goalie Gump Worsley’s wrist was just bruised in a warm-up accident on Wednesday night. The Gumper is unlikely to miss any time. Grant (Knobby) Warwick resigned as coach of the Sudbury Wolves of the Northern Ontario Hockey Association. He said fathers of the Wolves players were critical of his coaching methods. Rochester Americans of the AHL will host the Buffalo Bisons tonight with only one goaltender on the roster. Gary Smith is out with a groin injury, leaving Bobby Perreault as the starter. Manager-coach Joe Crozier says he will ask for a volunteer if Perreault gets hurt. Providence Reds of the AHL traded defenceman Noel Picard to Seattle of the WHL for another defenceman, Adam Keller.